Dr. Milad Eshaq, CLAS ’09, did not follow a traditional academic path to his medical degree. Eshaq chose to study English during his undergraduate studies — a decision he has never regretted. 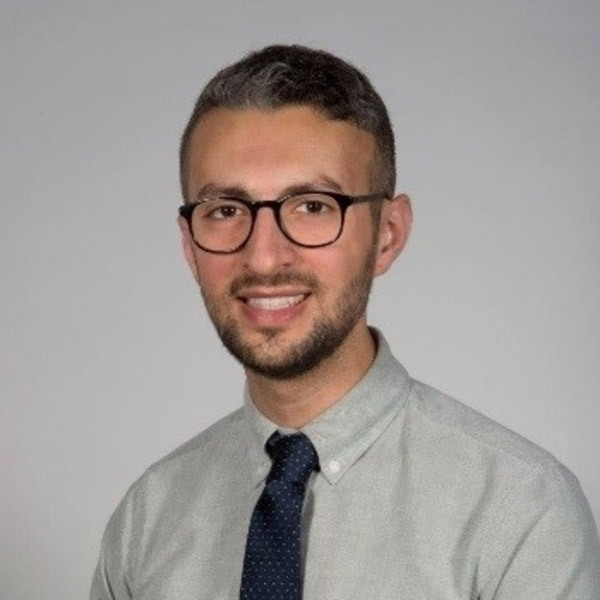 After attending the Medical College of Wisconsin and completing a residency in dermatology at the University of Michigan Medical School, Eshaq is now serving as a faculty member for the Department of Dermatology at U-M. Here, Eshaq reflects on how he came to study English and how it has benefited him as both a medical student and a physician. Tell us about what you currently do. I just finished my residency in dermatology in June 2017 at the University of Michigan Medical School and I’ve stayed on as a faculty member in the Department of Dermatology. In my last year of residency, I served as one of the chief residents, so I had administrative duties in addition to seeing patients. In my new faculty role, I’ll have a combination of teaching clinics with residents as well as my own clinics. In addition, I’ll have teaching, research, and administrative responsibilities. Why did you decide to attend Wayne State University? A combination of factors influenced my decision. I was interested in attending a large, public research university with diversity of thought and people. Additionally, I wanted to stay in Michigan for college. Wayne State also offered a generous scholarship package. What made you decide to pursue a degree in English? I first became truly interested in literature in my last year of high school because of an extraordinary English teacher. He taught me to read and interpret texts in a completely new way. Prior to this experience, I wasn’t really reading critically. Literature suddenly fascinated me. But I was also interested in science and had really started thinking about medicine as a career. When I first started college, I thought that the only route to medical school was a science degree, so I chose biology. However, as that first year went on and my interest in medicine solidified, the realization dawned on me that college would be my last opportunity to study literature in more depth. Conflicted, I asked around, and through some guidance, I learned that there was no requirement for a science degree to pursue medicine. Around the end of my first year, I switched to English. I’ve never regretted my decision. Do you believe your undergraduate studies prepared you for pre-med classes? I would say that they complemented each other. Through critical reading of literature and discussion, my English classes taught me to connect complex and sometimes disparate ideas in meaningful ways that are not readily part of a science curriculum. I found this helpful in my science classes in approaching multilayered concepts or processes. In turn, my science classes helped me to write and argue more precisely. There are a lot of students who believe that the only path to medical school is a biology or chemistry degree. What would you say to them? This is absolutely false. Many of my current colleagues studied the humanities as undergraduates and are outstanding physicians today. Medicine is changing rapidly in so many directions and it is most certainly more than just a science. We need physicians who can communicate effectively (with patients, colleagues, administrators), build strong doctor-patient relationships through empathy and personalized guidance, and tailor treatment plans based on analysis of multiple sources and types of data. The humanities impart critical thinking tools that can serve as a solid foundation for successful physicians, especially those in leadership roles, which require excellent communication skills. Do you have any additional advice for students considering a similar path? Be certain this is the right decision for you. Take time off after your undergraduate years if you need to solidify your decision. It is increasingly common for students to take a break after undergraduate education to work or do research before attending medical school. Medical training is a long and costly venture with many layered stressors, so you owe it to your future self to have thought the process through carefully and with clarity. That being said, the work is absolutely rewarding (and oftentimes humbling) and I love the dynamic nature of my day-to-day responsibilities. Keep your experiences varied by exploring non-science coursework, engaging meaningfully with your community, and connecting with people in disparate disciplines and with discordant thoughts. And, importantly, find and keep a good mentor.